Call 856-488-7868 or email Arts@CHTownship.com. For a complete schedule of events, visit the blog: http://CherryHillArts.blogspot.com. Seniors 55 and older are invited to enjoy the screening of the comedy "First Wives Club," starring Bette Midler, Diane Keaton and Goldie Hawn. A pizza and tossed salad lunch will be served before the movie. For more information or to reserve tickets: 856-488-7868 or Arts@CHTownship.com. Sponsored by Brandywine Senior Living. 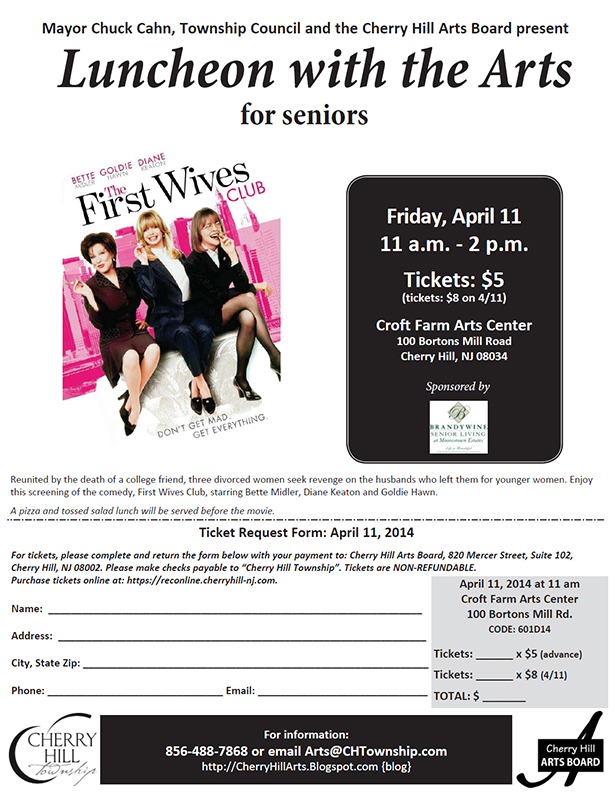 Senior Luncheon and movie: First Wives Club, Fri., April 11, 11 am - 2 pm. Tickets: $5 ($8 on 4/11). Call to reserve tix today: 856-488-7868.